AMBS Architects has proposed a 1,152-metre-tall skyscraper for Iraq's Basra Province, which would surpass Jeddah's Kingdom Tower and Dubai's Burj Khalifa to become the tallest building in the world. (DAILY MAIL)—Previously confidential plans have been released which propose building a giant 'Vertical City' in Basra, Iraq. 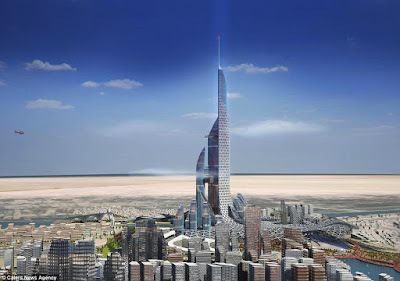 The structure—a tower named 'The Bride'—would feature four climbing towers dwarfing the world's other mega structures including the Burj Khalifa. The Bride's tallest structure would be a 241-floor, 3,162ft-high centrepiece, Tower 1, made up of seven sections that designers say would 'relegate super tall towers as a thing of the past'. The Basra province, in southern Iraq, has remained removed from the political and religious tensions elsewhere in the country.